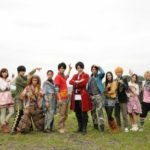 Super Sentai Celebrates 2000 Episodes With Kaizoku Sentai Gokaiger Reunion! A few weeks ago, we saw a leaked image of Captain Marvelous, leader of the Kaizoku Sentai Gokaiger taken during the filming of Dobutsu Sentai Zyuohger. Now at last, some details about this pending crossover have been revealed! All six Gokaigers will return once again for a 2-week special in episodes 28-29 of Zyuohger, celebrating TWO THOUSAND episodes of the Super Sentai franchise! As an additional anniversary prize, Zyuohger Episode 29 will apparently feature a special song: a revamp of Project R’s Super Sentai Hero Getter!– the original ending theme for Kaizoku Sentai Gokaiger. Gokaiger VS Zyuohger will air on September 4th and September 11 2016! Be sure to share your thoughts about this exciting crossover in our Ongoing Discussion Thread! You may recall that on this day last year we posted our very first 2.0 Gallery kicking off our journey of self-improvement of some of our previous works. That gallery was none other than S.H. Figuarts Gokai Christmas! This year we wanted to remind you of this awesome figure on Christmas and also let you know that this gallery is good for an entry in this years Toku Toy Box! As with any other Toku Toy Box eligible gallery you just need to make a relevant (non-spam) post in this thread to give yourself another entry in out giveaway! For a little refresher on this figure, Gokai Christmas was a special form achieved by Gokai Silver in Episode 44 of Kaizoku Sentai Gokaiger. A Christmas themed episode itself, Silver/Gai sought to be more festive in the battle against Zangyack and so using his special abilities merged the Gokai Red & Green Ranger Keys! The result is this fantastic repaint that was released in 2013 as a Toei Hero.Net exclusive. Though we’re sharing this gallery once again to celebrate the Christmas holiday, we know that many of our friends, family members, & staff also celebrate entirely different holidays all around the world. We’d like to take this moment to not only wish the community a Merry Christmas but also Happy Holidays! No matter what you may celebrate TokuNation is happy to have you here and we’re thrilled to continue yet another successful year with you. S.H. 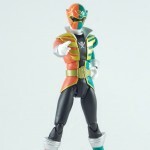 Figuarts Gokai Christmas Gallery 2.0 – Toku Toy Box Entry! Today TokuNation is happy to present a special Gallery 2.0 of a figure released nearly 2 years ago, S.H. Figuarts Gokai Christmas! A limited Toei-Hero.Net exclusive of a one-off form used by Gokai Silver/Gai Ikari in Kaizoku Sentai Gokaiger episode 44. A union of the Red & Green Gokaiger Ranger Keys, this form was Gai’s way of joining in the holiday festivities. We posted up a gallery of this bad boy all the way back in January 2013, but now we can finally give this fantastic figure the time & love it deserves with this full fledged gallery! Though we’re sharing this gallery to celebrate the Christmas holiday, we know that many of our friends family members & staff also celebrate entirely different holidays all around the world. We’d like to take this moment to not only wish the community a Merry Christmas but also Happy Holidays! No matter what you may celebrate TokuNation is happy to have you here and we’re thrilled to continue yet another successful year with you. We’re also sharing another installment of our Toku Toy Box Giveaway! Take a moment to peruse the over 50 images of Gokai Christmas after the jump, and be sure to leave a comment in this thread as well! A comment in this thread will make you eligible to win one of our four fantastic Toku Toy Box Prize Packs! Specifically this gallery will put your name in for a chance to win the All Aboard Sentai Prize Pack! That’s our gift to you this holiday season, a chance to win some awesome stuff and join in on the amazing discussions that happen here daily! 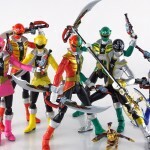 Our site sponsor BigBadToyStore.com snuck a pretty big update in the other day – they’ve got a complete restock on the Bandai Japan line of fan-favorite items from Kaizoku Sentai Gokaiger, aka the Japanese series that Power Rangers Super Megaforce is based on! This includes the Mobirate, the Gokai Cellular, and all the different DX Mechas! Now is a great chance to purchase the Japanese versions of these toys at an affordable price brand new, never opened! Check out the list below! 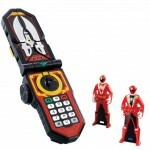 GOKAIGER ITEMS NOW IN STOCK! This is one of the largest restocks for a series that is many years old now! If you’ve been on the fence on collecting this stuff, then head on over to BigBadToyStore.com and order away! And don’t forget to use their Pile of Loot system to help you save on your shipping! This is by no means a new gallery (Den-O actually did this back on New Year’s Day to start off 2013), but we thought it was fitting today to bring up this gallery and share it with you again. When Ikari Gai – aka Gokai Silver – learned that he had the power to change and combine his Ranger Keys if he concentrated enough, he decided to combine the keys of Captain Marvelous and Doc to create Gokai Christmas, a half-red and half-green Gokaiger! Click here to check out the gallery! Don’t forget to let us know what you got for Christmas this year! You can find that on-going discussion thread by clicking here! Once again, Merry Christmas to all those celebrating today! Did you miss out on a previously released S.H. Figuart that has now become rather pricey and expensive on the secondary market? Or would you rather not deal with oversea websites like Mandarake and AmiAmi? We’ve scoured eBay to find some good deals on harder to find, sealed S.H. 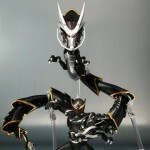 Figuarts and we’ve listed them here. But hurry – most of these items are Buy It Now or ending soon! Do you have items up for sale on eBay? If you do, why not post them in our Toku Toys on eBay forum for all our members to see! If you have something rare or unique, we’ll even front page it for the fan community to see! 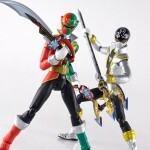 S.H.Figuarts Gokaigers Coming to North America! Let’s make a show of it! 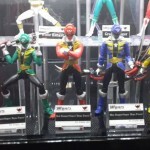 Gokaiger’s S.H.Figuarts will be landing state side courtesy of Bluefin! They’ll be released under their Super Megaforce names. No release dates have been announced, but collectors will know that unlike most Sentai Figuarts, only Gokai Yellow and Gokai Pink were limited run Web Exclusive releases. For now, it looks as though the Darins, which came packaged with GokaiYellow and Gokai Pink and were released as First Run pre order bonuses for the boys will be omitted from the North American release. Thanks to Tokunation member Kamen Blitz and Herotaku for the heads up! 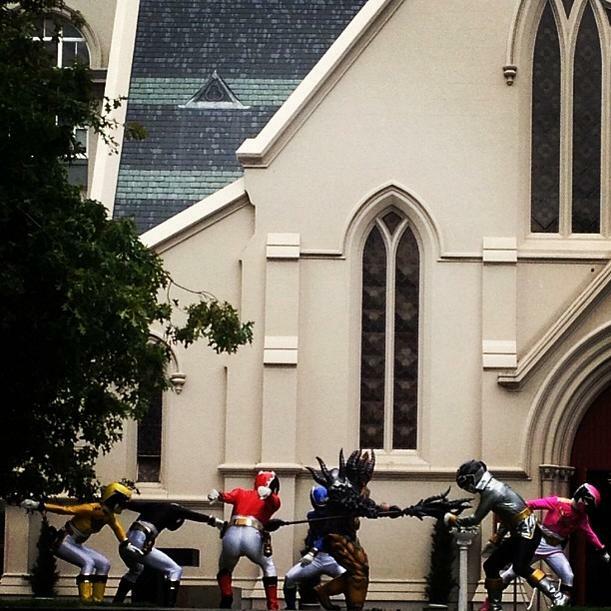 Yet another photo from the Super Megaforce filming has appeared via Instagram. This time, the photo confirms the appearance of Kaizoku Sentai Gokaiger’s sixth member: Gokai Silver! Interestingly the photo from the film set shows him fighting alongside the Megaforce Rangers in their Goseiger suits against Dial, the monster from the Abaranger Tribute Episode (Gokaiger 29). A second photo shows the Megaforce rangers preparing to change into their Gokaiger form, with Silver present. This seems to confirm that Gokai Silver will indeed be his own entity rather then a Gokai Change of some kind. Though it is still unknown in what capacity he’ll appear in, or even who’ll play Gokai Silver. HenshinJustice are reporting that a reliable source has informed them that a second Superhero Taisen film, entitled “Superhero Taisen Z” will be coming next year. Not only that, but this film is set to include a number of previous Ishinomori heroes such as Kikaider and Inazuman. 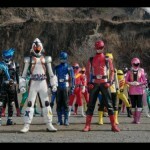 Looking forward to the possibility of a new Superhero Taisen movie? Share your thoughts after the jump! New Go-Busters vs Gokaiger Images and Info! The official Toei Tokumei Sentai Go-Busters production website has posted some new info concerning the forthcoming Go-Busters vs. Gokaiger movie, which will see the return of the 35th anniversary Super Sentai team! Set almost a year after the pirate Sentai left bound for the Zangyack home planet, they return to Earth completely different. The Go-Busters are in the midst of Earth’s greatest crisis when the Zangyack attacks Earth for the third time, only this time Enter is with them. But what is their real goal? Also included in the post were some new (small) images from the movie, which potentially gives us a glimpse of the new villains appearing. You can check these out after the jump! Go-Busters vs Gokaiger is due for release in Japan on January 19th 2013. All times are GMT -4. The time now is 8:45 PM.